You want to be an innovator? Knowing something about innovation might be a good place to start. Scott Berkun has studied innovation and the people who innovate. He is eager to share his insights, which is to say he is promoting the latest edition of one of his books. Having got that out of the way, let me say that Berkun is going to give you a lot for free while trying indirectly to persuade you that you should buy his book. Indeed, he gives so much you might even begin to wonder if you need to buy the book. Following the 1965 release of The Greatest Story Ever Told, a cynical joke circulated in the newly created audience for mainstream media satire: “I haven’t read The Book, but I have seen the movie.” There was a lot to be cynical about that year: The Sound of Music was released and the first contingent of US combat troops arrived in Vietnam. 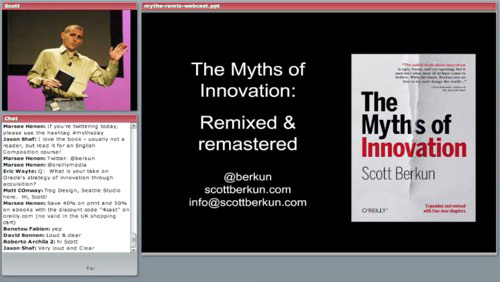 I confess that I have not read Scott Berkun’s book, The Myths of Innovation, but I have watched the webcast from O’Reilly, the book’s publisher. There is a certain charm about a specialist speaker on the topic of innovation who can casually admit that he doesn’t know why Lavoisier is famous. We all knew Lavoisier rejected the existence of phlogiston and identified oxygen, right? In that brief exchange is the nub of what Berkun is about: not about learning as a noun, but about learning as a verb. What follows shouldn’t be seen as arguing in a contrary manner against anything Berkun says in his presentation (I am sure that conversationally he could whup me with one hand behind his back) but rather a struggle to think for myself, and we all know how hard that can be. Berkun will approve of this: he explicitly says that if his webcast causes viewers to think for themselves then he has succeeded in one of his goals, although perhaps he had rather more profound results in mind. 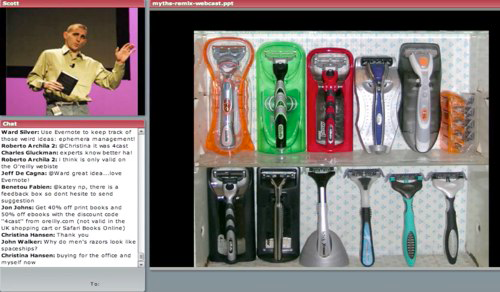 Berkun uses stories about innovators and their innovations as a coat hanger for the garment of his analysis of the process, and the myths that surround that process. It has become fashionable to reject anecdotes, often accompanied in Sociology 101 courses by denigrating reference to the Samuel Smiles book Self-Help. Perhaps, in the spirit of the hero of The Greatest Story Ever Told, if we thought of them as parables then there might be less sniffing from the groves of academe. The Berkun shtick (I use that word in unqualified admiration) is well rehearsed, fluid, articulate, and presented at a brisk enough pace to keep this listener engaged but not overwhelmed. Good luck with the book, Scott: Smiles had a runaway best seller with the format. After a preamble on the misused vocabulary and self-referential nature of many discussions of “innovation” (even suggesting that his listeners avoid using the word completely) Berkun does offer a definition: “Significant positive change.” I invite you to linger over that definition. The word new, or even a close approximation, does not appear. So the definition might even be interpreted to encompass reverting to something from the past. What about significant negative change? Berkun discusses the introduction of automated looms, acknowledging that particular innovation as being negative for the hand loom weavers, so that must mean within the terms of reference, for those negatively impacted, then an innovation is not an innovation. I am unable to decide if that makes the Berkun definition circular, self-referential, or possibly both. A symbol for self-referential is an Ourobus, which is a dragon chasing its own tail. Dictionary definitions and definitions in general tend to be a bit like that; undefined words are used to define other words. At some point the seeker after truth ends up back where he started without being much wiser. Perhaps only history can decide one way or the other on “significant” and “positive,” and here and now all we can see is the change. The Oxford dictionary limits itself to words with less value laden connotations, and some dictionaries list “stagnation” as the antonym of “innovation,” so perhaps the word “innovation” exists like Wittgenstein said of the word “game,” and a formal all-encompassing definition is not possible, and yet we all think we understand what is meant. Moving on: from the linguistic and abstract Berkun advances to the practical, albeit introduced by an extended discussion of Occam’s Razor. It’s fun and it’s illustrated, so humor him please. His call to go and make or do something rather than talking will appeal to action people. Those who like step programs and recipe books will feel at home here, and as always with Berkun there are plenty of stories. This section, and the talk, ends with some succinct recommendations contained in two slides. The final slide summarizes in four short lines the component parts of Berkun’s talk for the webcast. The session ends with a Q&A section, but don’t hold your breath for any profound revelations there either. So what was my experience of that webcast? An entertainment; a book promotion; suggestions on how to be innovative; cautionary tales on how to avoid the myths of innovation? All of those things. To return to the start: Berkun expresses “Wow” over the “Totally amazing” and “Mind blowing” technology by which the attendees are enjoying and participating in the webcast. 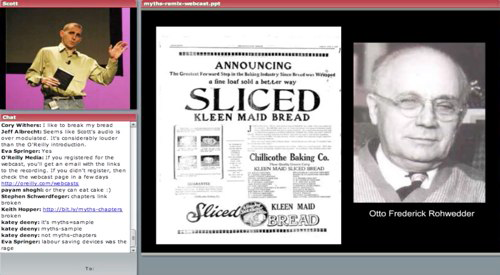 To strike a sour note, that Chat sidebar scrolling inane comments throughout the presentation is not an innovation: chattering in class has been a distraction since the first school existed. Despite the hype, this is broadcasting, but it’s only the broadcasting style of the old radio lectures with a selection of visual aid graphics thrown in, that would work one to one, or one to twenty in a format that is as old as language. One to one million may be powerful use of relatively new technology, but forgive me for being underwhelmed on that score. The last laugh remains with the publisher: the webcast is a promotion for a printed book, the sort of artifact that has been around for several hundred years. How much longer printed books will be around is a matter for conjecture: some reports suggest the Oxford English Dictionary (OED) may never be printed again. If print dies, then authors who can write and webcast will be worth their own weight in iPads. My final thought is that Berkun is not a pedagogue, or an instructor, or a tutor. For me at least, he is a sapper undermining the bastions of lazy thinking.